The iconic singer's gender and sexuality has been speculated on many times, and she pushes our expectations once again in what might be her boldest appearance yet. 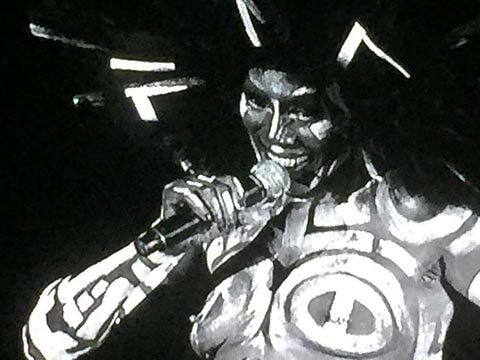 As the final show in an epic Hollywood Bowl season - which included a diverse set of stars including the American Ballet Theatre, the B-52s, and Kanye West - Grace Jones stunned last night in an epic set that had almost as many costume changes as it did songs. The night opened with Future Islands, a band with audience appeal that extends to this summer's Glastonbury Festival at the end of June. They are well-known to many for their explosive appearance on David Letterman early last year, especially for the notable strong strange presence and persona developed by their lead singer. But nothing any man fronting a band, even an extremely charismatic and engaged one at that, was ever going to truly prepare the audience for was the sheer force of nature that the headliner was about to project into the audience. As the opening chords of the first song played, a spotlight grew on Grace Jones, who appeared wearing only an underbust corset, thong, and incredible metalwork skull face mask that slid up for her to sing past. The rest of her was not at all naked, covered as her skin was by the chalk-white body paint in the style that Keith Haring made iconic on her so many years ago. Check out the patterning in his epic 50 foot skirt in one of her most classic videos, I'm Not Perfect, But I'm Perfect For You, a title she co-wrote with Mick Jagger of The Rolling Stones and notably self-directed. All the usual words - striking, bold, unique, etc - applied the instant that she appeared. But the audience still didn't know what was in store. Read on to the next page for so much more of the singer, and very NSFW details.